The objective PAVN forces during the third phase of the Nguyen Hue Offensive was to seize the cities of Kontum and Pleiku, thereby overrunning the Central Highlands. This would then open the possibility of proceeding east to the coastal plains, splitting South Vietnam in two. The highlands offensive was preceded by NLF diversionary operations that opened on 5 April in coastal Binh Dinh Province which aimed at closing Highway 1, seizing several ARVN firebases, and diverting South Vietnamese forces from operations further west. North Vietnamese forces, under the command of Lieutenant General Hoang Minh Thao, commander of the B-3 Front, included the 320th and 2nd PAVN Divisions in the highlands and the 3rd PAVN Division in the lowlands - approximately 50,000 men. Arrayed against them in II Corps were the ARVN 22nd and 23rd Divisions, two armored cavalry squadrons, and the 2nd Airborne Brigade, all under the command of Lieutenant General Ngo Dzu. It had become evident as early as January that the North Vietnamese were building up for offensive operations in the tri-border region and numerous B-52 strikes had been conducted in the area in hopes of slowing the build-up. ARVN forces had also been deployed forward toward the border in order to slow the PAVN advance and allow the application of airpower to deplete North Vietnamese manpower and logistics. The Binh Dinh offensive, however, threw General Dzu into a panic and almost convinced him to fall for the North Vietnamese ploy and divert his forces from the highlands. John Paul Vann, director of the U.S. Second Regional Assistance Group, reassured Dzu that it was only a ruse and to remain ready for the main blow, which he was convinced would come from western Laos. John Vann, although a civilian, had been granted the unique authority to command all U.S. military advisors within his region. Vann worked day and night, utilizing his extensive civilian and military contacts to channel U.S. support (especially air support) to the region. 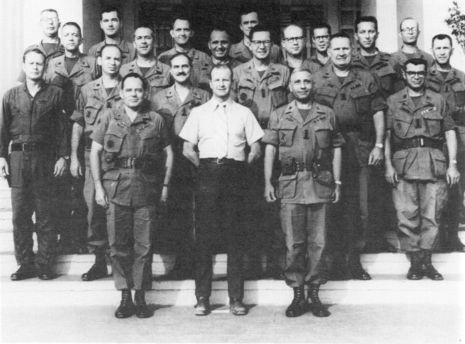 Major General John Hill, Dzu's senior military advisor, described Vann's extraordinary actions: "The rest of us organized around Vann's personal efforts and concentrated on getting the resources marshalled to take advantage of the leadership he was exerting with the Vietnamese." To counter the possible threat from the west, Dzu had deployed two regiments of the 22nd Division to Tan Canh and Dak To II and two armored squadrons to Ben Het. On 12 April, the 2nd PAVN Division, elements of the 203rd Tank Regiment, and several independent regiments of the B-3 Front attacked the outpost at Tan Canh and the nearby firebase at Dak To. When the ARVN armor moved out of Ben Het toward Dak To II, it was ambushed and eliminated. Overwhelmed, the South Vietnamese defense northwest of Kontum quickly disintegrated, placing the command of III Corps in a quandary. With the rest of the 22nd Division covering the coast, there were few forces left to defend the provincial capital of Kontum. Inexplicably, the North Vietnamese southern advance halted for three crucial weeks. While the northern crisis waned, however, General Dzu began to unravel, finding it increasingly difficult to make decisive decisions. Vann gave up all pretext of South Vietnamese command, took over himself, and openly issued orders. He placed responsibility for the defense of the city of Kontum on the shoulders of Ly Tong Ba, commander of the 23rd Division. Vann then utilized massive B-52 strikes to hold the North Vietnamese at arm's length and reduce their numbers while he managed to find additional troops with which to stabilize the situation. 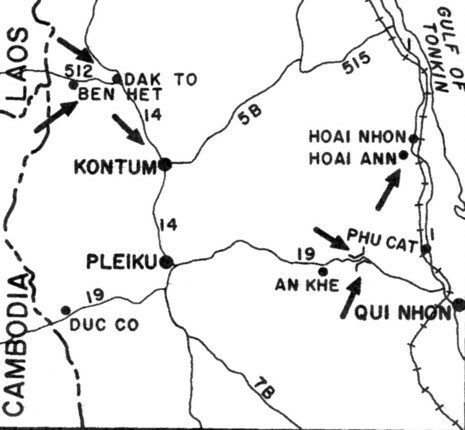 By 14 May, North Vietnamese forces had reached Kontum and launched their main assault. The 320th PAVN Division, the 1st and 141st Regiments of the 2nd PAVN Division, and elements of the 203rd Tank Regiment attacked the city from the north, south, and west. By the time of the assault, the city mustered a defensive force that consisted of the 23rd Division and several Ranger groups. Their three-week delay cost the North Vietnamese dearly. By 14 May the worst of the fighting in I and II Corps was over and a majority of the B-52s were free to concentrate on the Central Highlands. During the North Vietnamese attack, the positions of the 44th and 45th ARVN Regiments crumbled and were overrun, but a well-placed B-52 strike landed directly on the PAVN attackers at the point of the breakthrough. The next morning, when the South Vietnamese returned to their former positions unopposed, 400 bodies were discovered, along with seven destroyed tanks. At Vann's insistence, a personnel shake-up took place in III Corps when President Thieu replaced Dzu with Major General Nguyen Van Toan, whose outwardly confident and assertive nature was the complete opposite of Dzu's. 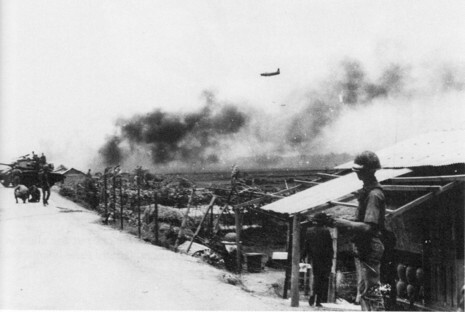 The actions at Kontum for the following two weeks became characterized by massed PAVN assaults that were lashed by B-52, tactical air, and helicopter gunship attacks. ARVN troops then counterattacked over the remains of the attacking wave. On 26 May, four North Vietnamese regiments supported by armored forces managed to punch a hole in the defense, but their advance was halted by U.S. helicopters firing new, tube-launched, optically tracked, wire-guided (TOW) missiles. During the following three days of fighting, 24 North Vietnamese T-54 tanks were destroyed by TOWs and the breach was sealed. With the aid of the U.S. and South Vietnamese air forces and despite severe losses, ARVN managed to hold Kontum during the remainder of the battle. Aerial resupply was supported by the US Army's "549th QM (AD)" (QuarterMaster, Air Delivery) Rigger Company, which had been rapid-deployed from Okinawa in early April. By early June, the North Vietnamese faded back to the west, leaving behind over 4,000 dead on the battlefield. It was estimated by U.S. intelligence that total PAVN casualties in the Central Highlands during the offensive totaled between 20,00 and 40,000 troops. John Vann did not have time to savor his victory. While returning to Kontum from a briefing in Saigon on 9 June, he was killed in a helicopter crash.